Recently, I started using Aptana Studio 3 for my Django projects and I am pretty impressed with it so far. Aptana shares the same core plugins as that of Eclipse with some bells and whistles – ships with pyDev, built in terminal (like Kate), git integration, multi pane editor, smart bundles for python, Django and Django templates. Like Eclipse, Aptana has a good set of tools for debugging Django apps and this has been the primary reason for switching from the awesome textmate. Just for kicks, and with “a nice to have” feature in mind, I tried building my own plugin for Eclipse. After some googling around and writing some java code, I got my hello world plugin up and running. The inspiration behind taking the time to learn the plugin architecture was to build a simple toolbar for debugging. After an hour of fooling around, I created the Eclipse debug toolbar, which means now I can work in debug mode(which is almost all the time) and still have a full screen editor. You can grab the eclipse icons here. Since both Eclipse and Aptana share the common base, this plugin (and most other plugins) works in both the IDEs. 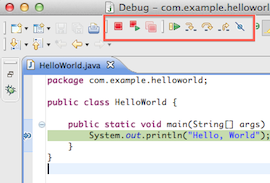 Source Code: Eclipse Debug Toolbar on Github.